Background Improving the health of black and minority ethnic (BME) men in the US continues to be a public health priority. Compared with men of other races and ethnicities, African-American men have higher rates of mortality and morbidity from chronic illness and diseases including cancer, heart disease, prostate cancer, diabetes and HIV/AIDS. One way to address these disparities is to include African-American men in health research, to elicit their perspectives on health risks and protective factors. These can then inform interventions aimed at reducing health disparities. However, challenges remain in recruiting and engaging African-American men in health research. Aim To provide strategies for recruiting African-American men in health research, using as an exemplar a qualitative study of fathers’ perspectives of sexual health promotion with young African-American males. Discussion Efforts are needed to increase the representation of African-American men in health research. 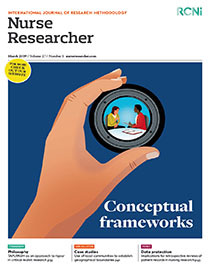 Ensuring that researchers are aware of the cultural, social and environmental factors related to decisions to participate in research can lead to effective methods to recruit and engage them. Conclusion There are several essential strategies for increasing African-American men’s participation in health research: ensuring the research team is culturally and gender-sensitive; recruiting in trusted environments; using respected gatekeepers; developing trust with participants; and being transparent. Implications for practice Implementing strategies to include African-American men in health research has the potential to improve health disparities in the US.